What a fantastic giveaway idea for your next promotion, there isn't a person you know that doesn't have a smart phone so why not give people a charging cable with your custom branded logo. They will use it every day and constantly be reminded of your company. We have Australia's most competitive price, service and quality. Teamed up with a free mockup service so you know exactly what you are ordering, why go anywhere else for your promotional items? Why settle for digital marketing and print media when so many promotional items now allow a business to get their name in the public's eye? For example, a large majority of individuals currently make use of smartphones or other mobile devices as they go about their day. Promotional Charging cables are a great way to provide an item individuals will use on a regular basis and do so at a very low price. The chargers provide visibility for the company offering them and deliver a powerful message to all who see these devices. Consider using this marketing technique to take your business to the next level while generating leads and additional business. 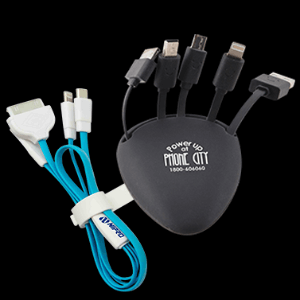 Branded charger cords come in a wide range of styles to ensure every business can find one that fits their budget while complementing their other marketing materials. Each cord can be imprinted and branded in a way that truly reflects positively on the business offering the item, and the cords can be paired with other promotional items, such as travel chargers, keychain chargers, and USB power hubs. The combinations are endless when this option is selected, and the business offering the item will find they obtain a good return on their investment. This is due to the regular use the items will receive. When choosing promotional charging cables, be sure to see which devices the cords will be compatible with. Just as there are numerous mobile devices available today, the options for these cables are endless. Companies need to ensure the cord is Apple, Windows, and Android compatible and the cord may be used with any USB connection. Doing so ensures an individual doesn't obtain a cord that won't benefit their life in one or more ways. Many cords now offer all three options in one simple unit, making it possible for an individual to use the same cord for multiple devices, and this is sure to be appreciated. Promotional phone cables offer one major advantage over many other items used in giveaways today. They are small and portable, thus they can be taken everywhere the user goes. It isn't possible to do this with an umbrella or a stress ball, thus the business doesn't receive as much exposure. However, charging cables take up very little space in a purse or briefcase, and they can even be carried in the user's pocket. This ensures they are more visible, thus the business featured on the cord receives more exposure. When choosing a promotional item provider to work with, companies need to take many factors into consideration. For example, does the provider offer other items that might be of benefit to clients of the company? Selfie sticks remain very popular, as do car chargers and travel adapters. Find a provider that stocks a wide range of items to ensure continuity of marketing materials. Determine if they offer assistance with product selection and find out about their available artwork options. A company that takes the time to do this when choosing a promotional item provider will find future purchases become much easier thanks to the time they spent now. Every business benefits when this is the case.